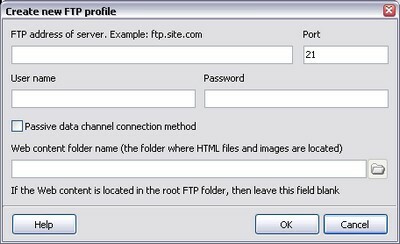 FTP profile stores a set of web site parameters like address, port, user name, etc. You can have as many profiles as you want. It can help you to upload the gallery to different web sites easily. When you are about to publish your first gallery with Extreme Thumbnail Generator you will see the FTP settings wizard which helps you to create your first FTP profile. To create more FTP profiles use menu item Tools - Settings... and click on the FTP profiles tab. To create a new FTP profile click the Create new profile... button. It opens the following window. If you are not sure about the FTP settings of your web server please contact your hosting company support for this imformation. Enter the FTP address of your server in this field. For example: your_site.com, ftp.your_site.com. The default FTP port is 21. Change it only if you are absolutely sure about it. Enter your FTP user name and passord in these fields. If this box is checked, then FTP will work in a passive mode. Enter the name of the folder on your server where all web content is stored. Web content is HTML pages, images, and other files used by HTTP server. If web content is located in the root folder of your server, then leave this field blank. If you entered all parameters of your server, then you can use the button to select the web content folder.